Water is the First Law of Wellness. 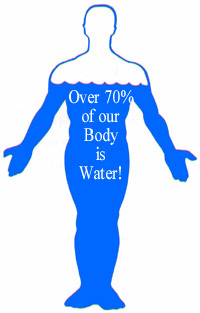 Our bodies are made up of over 70% water. 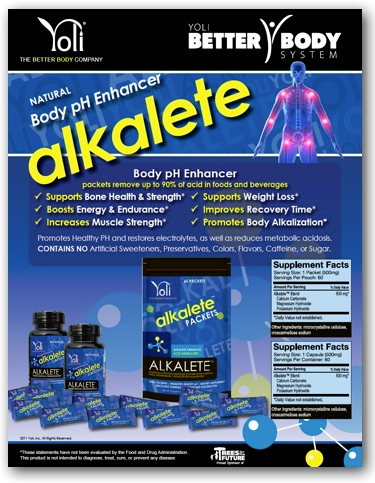 Alklalete comes in capsules or in their drink mixes like The Truth, Fun or Passion. 53% acid reduction on average. Helps with heartburn. Total healing of chronic illness only takes place when and if the blood is restored to a normal, slightly alkaline pH. According to Dr. Robert O. Young's book, "Sick and Tired", the New Biology when the body is in healthy alkaline balance, germs are unable to get a foothold. Cancerous tissues are acidic, whereas healthy tissues are alkaline. When oxygen enters an acid solution it can combine with H+ ions to form water. Oxygen helps to neutralize the acid, while at the same time the acid prevents oxygen from reaching the tissues that need it. Acidic tissues are devoid of free oxygen. An alkaline solution can provide oxygen to the tissues. The pH scale goes from 0 to 14, with 7 being neutral. Below 7 is acid and above 7 is alkaline. The blood, lymph and cerebral spinal fluid in the human body are designed to be slightly alkaline at a pH of 7.4. 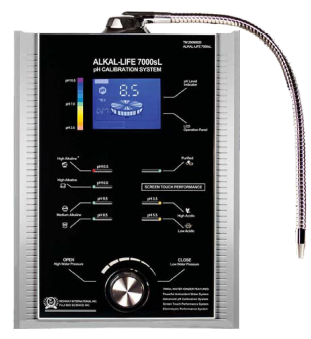 Alkalife Water Filter by Richway produces Ionized Filtered Water like Kangen Water at different PH levels but for much less.